Everyone loves a good old s’more. 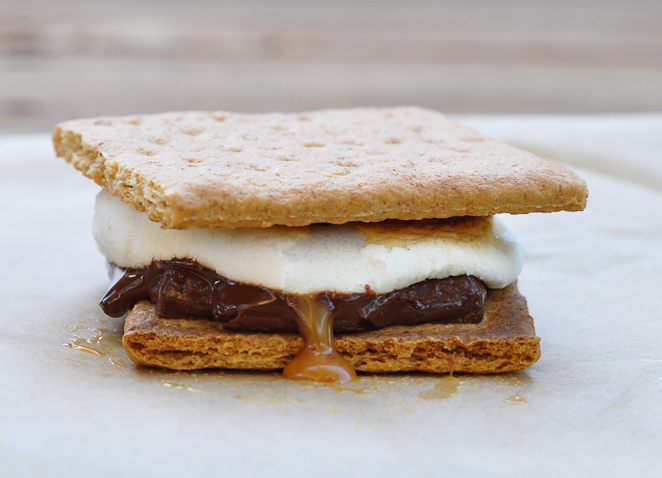 S’mores and summer go together like peanut butter and jelly. There’s nothing better then roasting a marshmallow over a campfire till it’s browned and crisp, and then mashing it between two graham crackers and a hunk of chocolate. The marshmallow and chocolate ooze out over the sides, and you just have to get in there and devour it before it spills out all over the place. Am I enticing you? Do you want a s’more? S’more’s are not just for camping anymore. They can be made at a moments notice in the comfort of your kitchen (though it’s not as fun as roasting them over a campfire). The hardest part is coming up with a clever name to call these favorite childhood treats. 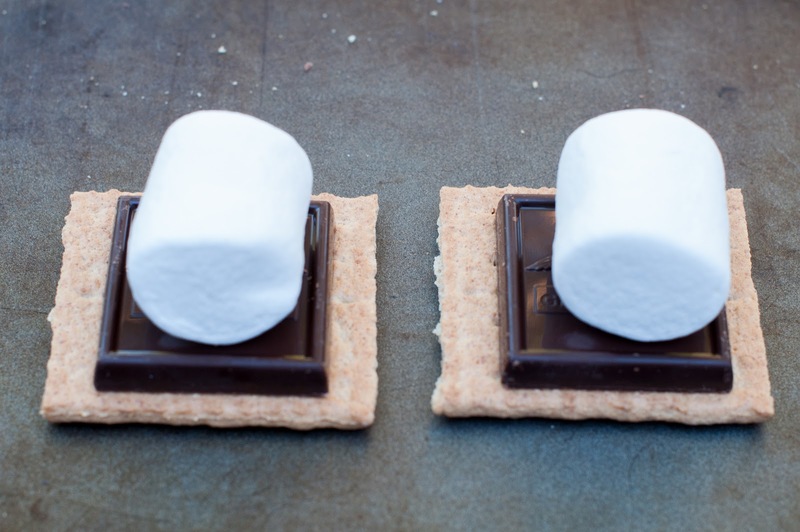 I am calling them no campfire s’mores, but I’m willing to create a merit badge for all you Boy and Girl Scouts out there who can come up with a better name. Send me your suggestions, and I will change the name. 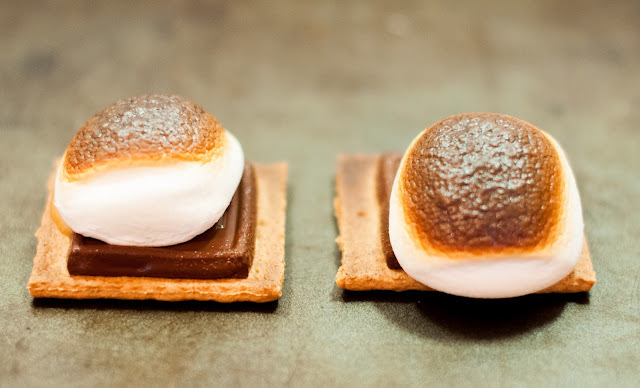 I would call them homemade s’mores, but I’ve already done a post on that where I actually made the graham crackers from scratch (Ok, I love s’mores!). I reserved that recipe for the fall and winter because honestly, I’m not much of a cookie baking gal in the summer. I would rather be out enjoying the outdoors than baking away in the kitchen. All you need for this recipe is a broiler, a box of graham crackers, chocolate and some marshmallows. I keep these ingredients on hand for those last minute dessert ideas which come in handy for those last minute sleepovers. Below are your run of the mill s’more ingredients but with a slight twist. We chose to use these Ghirardelli dark chocolate carmel squares. 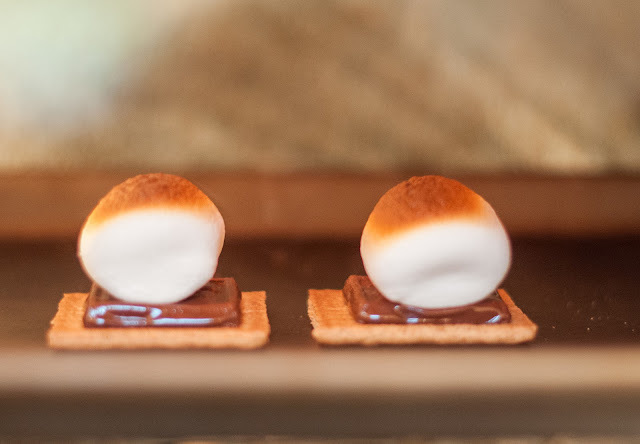 They take your basic s’more to a whole new level. The melted chocolate and carmel oozing together with the marshmallow is pure bliss to your tastebuds. Get out a baking sheet, and top one half of the graham cracker with the chocolate and marshmallow. Put the s’mores under the broiler, and broil till the marshmallow browns and the chocolate starts to melt. Take the s’mores out of the oven and top them with the other graham cracker half. No stick or campfire needed for these s’mores and the clean up is a cinch! These could also be called the lazy mama or city mama s’mores. Got a better name? Let me know! Like s’mores, then you have to try my frozen s’mores. Dark chocolate caramel sounds like quite the improvement over the humble Hershey bar, Jackie. You could call them Broiled S’Mores, since that’s how you cooked them, but that doesn’t have a lot of zing — I think dark chocolate caramel s’mores might entice a few people.